While some garden books offer advice on growing cacti and succulents, others offer inspiration for those designing cacti and succulent gardens. Here are some books that offer wonderful design ideas. Whether you’re growing jungle cacti or desert cacti, consider stone as a primary material for your cacti and succulent garden. This material can be used as a focal point in cacti and succulent designs. These create beautiful settings for displaying the architectural beauty of cacti and succulents. various projects that will be of interest to cacti and succulent gardeners. These include rock gardens and wall gardens, both of which provide ideal growing conditions for cacti and succulents. Readers can learn about all the different kinds of stones and how to use them. This also shows how to construct a dry stream bed, which would be an ideal situation for growing cacti and succulents. Tropical gardens bring to mind lush palm trees, ferns, and orchids. Yet, cacti and succulents deserve a place in tropical garden design. For that reason, I recommend “Modern Tropical Garden Design” by Made Wijaya. This was released by Tuttle Publishing/Periplus Editions. It is lushly illustrated in full color. This book profiles gardens by leading garden designers from all over the tropical world. This provides inspiring ideas on how to use cacti and succulents in tropical gardens. There are garden styles here to suit every taste and need. A number of these designs feature cacti and succulents as prominent themes. Among these are dry gardens using stones as mulch. In one garden, ice plants thrive in a walled garden. This book also has a list of suitable plants for tropical gardens, including cacti and succulents. “New Garden Design-Inspiring Private Paradises” by Zahid Sardar has lush photos by Marion Brenner. This was released by Gibbs Smith. It has an enlightening history of gardens. This book profiles over 30 exquisite American gardens. The designs are arranged by theme or topic. The section on dry gardens will be of special interest to cacti and succulent growers. It features seven cutting edge designs. 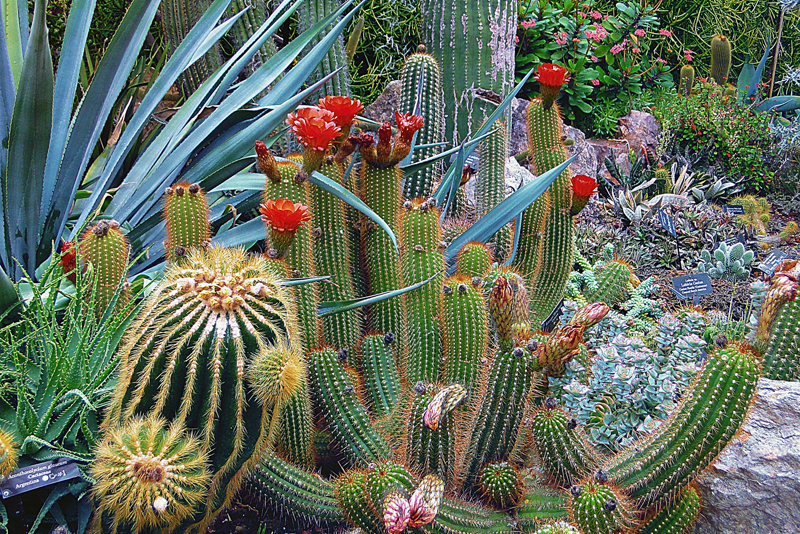 They include one devoted to cacti, while another showcases a collection of euphorbias. Another features over a thousand different kinds of succulents. With all the emphasis on green roofs these days, the question of aesthetics seems to have been cast aside. This book profiles a breathtaking roof garden of succulents. This design should provide hope for other city gardeners. The succulents are planted in special containers that resemble undulating raised beds that vary in height.